Makeup artist Dotti’s guide to Cindy Crawford’s cocoa smoky eyes and contoured cheeks. Beautiful makeup that transcends occasions — or, as VIOLET GREY calls it, never-fail makeup — is the Cadillac of the cosmetics world. No matter the location, time of day or latest trends, it always impresses upon arrival. The above artistry of Australian makeup artist Dotti, a thoughtful combination of earthy-colored eye shadows, cleverly applied highlighter and hydrated lips is universally flattering for every complexion and occasion. Not that it’s difficult to make Cindy Crawford look camera-ready. For the supermodel's cover shoot with VIOLET GREY, Dotti (who also works with Naomi Watts, Katie Holmes and Blake Lively) was inspired by Ali McGraw to build an all-American look with depth and dimension. “This look came from the idea that all a woman needs to do her makeup is a basic kit,” Dotti told VIOLET GREY. “I used colors like coffee, taupe and brown, then I added highlighter on top.” Her expert touches added a special edge to Crawford’s wear-with-everything look. First, she diluted foundation with moisturizer to create a sheer base, then she dabbed luminizer into the inner corners of eyes, and she kept lips soft and hydrated with a rich, lightly tinted balm instead of lip color. Dotti’s supermodel-approved tutorial, and The Violet Code–approved products that should be included in every woman’s mainstay kit, below. The Australian makeup artist's step-by-step guide to Cindy Crawford's wear-with-everything beauty look. To begin, mix a dab of moisturizer into YSL’s Le Teint Touche Eclat Foundation on the back of your hand before applying to skin with a damp sponge. This provides a sheer base that lets the skin show through. Then cover any lingering imperfections with Kevyn Aucoin’s Sensual Skin Enhancer with a small brush. To lightly contour the face, dust Nars’ Bronzing Powder in Laguna under the hollows of the cheekbones, along the jawline and on the forehead. This gives skin definition and warmth without appearing overly made up. Blend a few drops of Giorgio Armani’s Fluid Sheer in No. 11, a sheer peachy hue, onto the apples of cheeks. Lightly groom brows by brushing them up with a spooly brush and filling in only where needed with Laura Mercier’s Brow Definer and an angled brush (Violet says try Utowa’s Oblique Eyebrow Brush 70B). The trick is to use short strokes that mimic the length of real hairs. 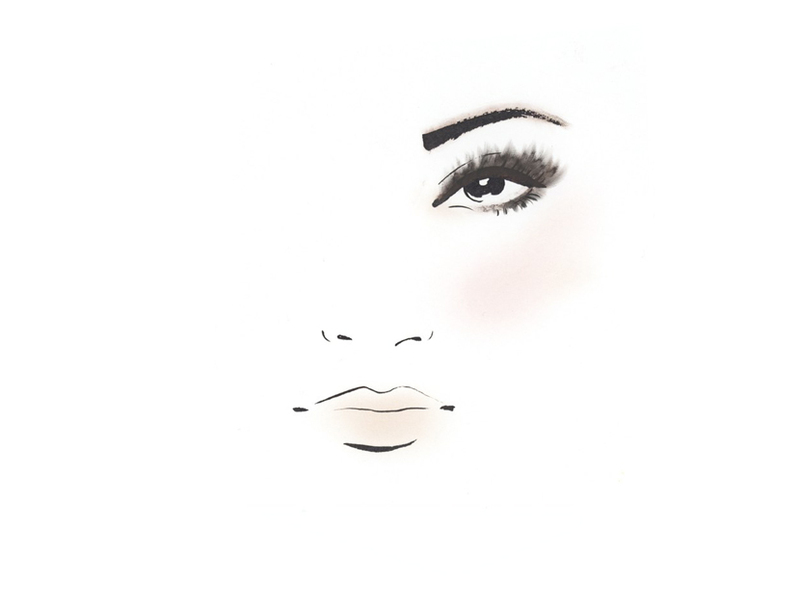 For a naturally smoky effect, slowly layer various neutral shades on the eyelids. Use a taupe hue (M.A.C.’s Eye Shadow in Charcoal Brown) to define the crease, layer a shimmery tan (M.A.C.’s Eye Shadow in Satin Taupe) on top, then build the desired intensity with a warm, coppery brown (Nars’ Duo Eye Shadow in Cordura). Curl the lashes and apply two coats of Serge Lutens’ Cils Cellophane Mascara in Black. Dab Nars’ The Multiple in Copacabana directly into skin and blend with your fingers in a C shape: Begin under the arch of the eyebrow, swoop around the outside of the eye and end on the top of the cheekbones. Use your finger to dab the highlighter into the inner corners of the eyes and on the inner portion of the eyelid for a bright-eyed look. The résumé of New York–based makeup artist Dotti reads like a dermatologist’s wish list: The Aussie native is responsible for Alicia Keys’ lit-from-within glow, Emma Watson’s fresh-scrubbed flush and Cate Blanchett’s age-defying luminescence. My obsession with SKIN borders on Hannibal Lecter territory. See VIOLET GREY's entire shoot with the legendary supermodel.